City Garden Holiday Fair is December 8th, all are welcome! One of the things that initially drew me to City Garden Waldorf School in Pilsen was the big role that food played in the life of the school and the life of the community. When I heard that there was a school close to home where they baked bread and made soup and kept an organic garden, an apple tree, and honeybees, I knew that it was the place for me. Alas, I am not in Kindergarden, so I have to settle for attending the Holiday Fair at City Garden. The Christmas or Holiday Fair is a long-standing and much anticipated tradition in Waldorf Schools. For one day every year City Garden, and many other Waldorf schools around the world, is transformed into a winter wonderland full of holiday cheer and merrymaking. This year, there will be live entertainment throughout the day including snow carving, a puppet show, carolling, and many live musicians. There will also be a petting zoo, a fairy house, kids crafts, vendors, food, and so much more! 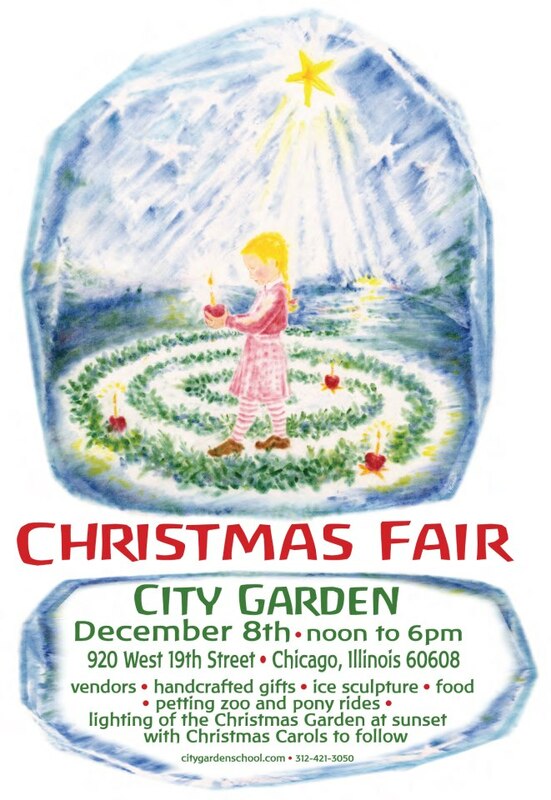 For this wonderful holiday event, families of City Garden and Urban Prairie Waldorf School students pitch in to prepare and donate so much of what you see at the fair. The “workshops” they hold are not only a way to prepare items for sale at the fair, but a way to build community at City Garden, says Jone Hellesoy, Director of City Garden Waldorf School. All of the foodie elves at City Garden have been busy making homemade soft pretzels, baked goods, quiche, and lots of other amazing homeade goodies. Last week some City Garden families got together and made over 650 tamales to be served at the Holiday Fair on December 8th. City Garden’s crafty elves have also been at work turning out handmade holiday and children’s items to be sold, proceeds for the sale of items at the City Garden craft table and the food in the cafe will benefit City Garden Waldorf school. This event is free and open to the greater community. Please come and get to know City Garden and enjoy all the wonderful things this season has to offer. City Garden Waldorf School is located at 920 W. 19th Street. The Holiday Fair will take place on Saturday, December 8, 2012 from 12pm-6pm.